Singing many heart-warming medleys, standard classics and sweet loving harmonies Daniel O'Donnell puts on a show of a lifetime! Irish singing sensation Daniel O'Donnell, who's touched the hearts of people all across North America, shares the stage with some of the most popular and enduring stars in American music. 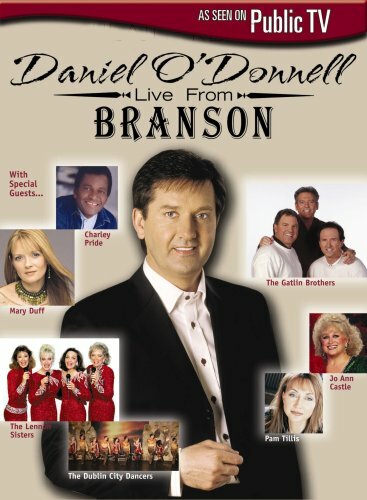 Taped at the Tri-Lakes Center in the heart of Branson, Missouri, theater district, Daniel O'Donnell Live from Branson is a music extravaganza that features all the songs performed in the PBS concert special, plus approximately 1-hour of additional performance not seen on the original broadcast. Featuring special guests: The Lennon Sisters, Charley Pride, The Gatlin Brothers, Jo Ann Castle, Pam Tillis, The Dublin City Dancers and Mary Duff. This 2-disc closed captioned compilation runs approximately 190 minutes and includes 55+ songs.